Portals are complex and expensive investments. Their scope and reach should touch and positively affect every corner of your organization. The rigor and execution required to build and maintain a successful intranet or enterprise portal is massive – from governance to content management, and application integration to business process mapping. Portals also contain bundled applications and elements found in other solutions (e.g. content management systems) including search, content and document management, web 2.0 (enterprise 2.0), etc. However, application integration and personalization are the principal drivers behind choosing a portal solution over other alternatives. The Enterprise Portal Blueprint © 2013 is the all encompassing plan for assessing, planning and implementing an enterprise portal (Internet, extranet or intranet portal). Our model for success, the Nexus of Intranet Success, is one that has been built over many years on the strength of dozens of projects. Enterprise Portal Blueprint encompasses two distinct phases: Assessment and Planning. Assessment serves two important functions: it documents the needs and requirements of the user population and those of the business and its stakeholders while aligning project goals with corporate goals and objectives. 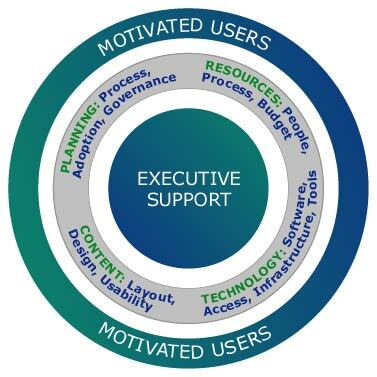 This phase includes a comprehensive intranet evaluation and gap analysis along with business requirements and stakeholder interviews, user reviews, surveys, focus groups, technical infrastructure analysis, and benchmarking against other leading intranet portals. Planning incorporates both the strategic vision and the functional plan and maps out the strategic and tactical steps for designing the site or portal. During this phase, the high-level vision, mission, and success factors and measurements are identified. As well, detailed tactical plans are drafted, including the functional plan, high-level information architecture, wireframes and design concepts. This phase also includes the review, evaluation and selection of a portal solution product. Prescient Digital Media does not use a proprietary technology for building or constructing client intranet sites or intranet portals. We are ‘technology neutral’ which means that we will work with you to identify the appropriate technology solution based on your business requirements, and not "who we know" or based on reselling agreements and commissions. In identifying the best solution for your organization we manage all aspects of the vendor process including the evaluation and selection of the vendor, negotiate technology licenses and fees, project manage the implementation, and even manage and execute ongoing site operations including custom content development and translation services. The output of these phases constitutes the Enterprise Portal Blueprint for guiding the implementation of the portal and the underlying governance and technology foundation. The Blueprint contains the map and intranet portal action plan supported by information gathered throughout the course of the project including user research, benchmarking, wireframes, information architecture, technology recommendations, an implementation roadmap, and design concepts. Finally, the Blueprint serves as the basis for evolving your site, establishing baseline targets (e.g. user satisfaction, ROI, etc.) for measuring its ongoing and future performance, and achieving its potential and value. Prescient’s experience and knowledge of intranets and portals is unsurpassed by any firm in its class. Our clients include HSBC, Mastercard, Pepsi, Royal Bank (RBC), WestJet and dozens of others. For more information on the Enterprise Portal Blueprint, please contact us directly.